What kind of Republican can win Maryland’s Senate race in 2016? Sen. Barbara Mikulski’s press conference to announce her retirement last week has hit Maryland politics like a tornado. There are fast moving parts all across the state. Seven of the eight members of Congress are said to be looking at the race. In the last five days, two congressional members have announced their intention to run. What does this all mean? Maryland has not experienced this type of a seismic shift in a very long time. When Sen. Sarbanes retired in 2006 only one Congressman jumped into the race, though there were a total of eighteen candidates in the Democratic primary for United States Senate. Based on the current announcements there will be at least two open House seats in Districts 4 and 8. The mad scramble is on among the Democrats to determine who will run for those seats. There is no reason for any legislator or an elected county official with interest to not get in the race. They have nothing to lose since their next election is not until 2018. At least on the Democratic side expect rough and tumble primaries for the Congressional seats at the same time Congresswoman Edwards and Congressman Van Hollen are focusing on each other. Enough about the Democratic side for the Senate seat. What about the Republicans? Can a Republican win? Having reviewed election results and turnout data from the Maryland State Board of Elections. Republicans are at a greater disadvantage in Presidential elections here than in Gubernatorial elections. There are also significant differences by party by year for turnout in non-Presidential years. A higher percentage of Republicans turned out in 2002, 2006, 2010, and last year than Democrats. Of the last four senate races that coincided with the Presidential election the Republican averaged 681,298 votes compared to 1,379,086 votes on average for the Democratic candidate, a difference of nearly 700,000 votes. By way of comparison in the last four senate races held at the same time during a Gubernatorial election the Republican nominee averaged 611,848 votes while the Democratic nominee averaged 994,486 votes, a difference of around 380,000 votes. What does this mean for a Republican? History demonstrates a race for United States Senate in a gubernatorial year is a much better opportunity for a Republican candidate. But for 2016 can a Republican win the Senate seat? Yes, everything is possible, but how can this be done? Voters in the state proved they wanted something different in November 2014. There were multiple candidates for Governor in both primaries who were tried and true long term politicians but Larry Hogan won his primary and Anthony Brown won his primary. Brown ran his general election campaign as the frontrunner and we know how that turned out. Hogan ran on issues that mattered most to voters including getting Annapolis’ fiscal house in order, cutting taxes, and working to create jobs by making Maryland more business friendly. Hogan’s powerful message was well received by Republicans, nonprimary voting Democrats and unaffiliated voters. As of today there are two high profile Democrats in the race for United States Senate. 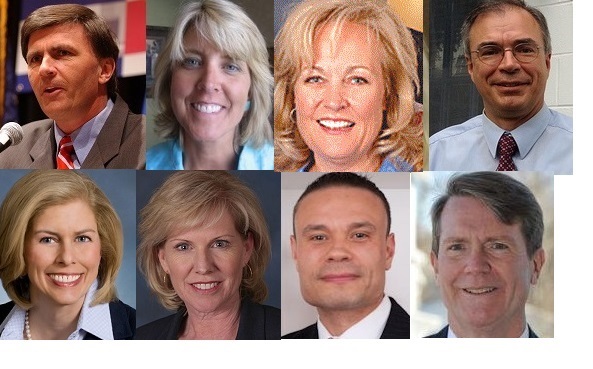 Republicans are talking about former Governor Bob Ehrlich or possibly the former First Lady Kendel Ehrlich, Delegate Kathy Szeliga, Congressman Andy Harris, former Delegate Jeannie Haddaway Riccio, former County Executive Laura Neuman, Dan Bongino, Richard Douglas, Mary Kane, and others. To win the Senate seat I believe Republicans should consider a candidate who has a profile similar to Governor Larry Hogan. Governor Hogan is not a career politician. Yes he had run for office before and had served in the Ehrlich Administration, but he is a successful small businessman. He has real life experiences and was much better received than his opponent. Voters trusted him and they could tell he empathized with them and their troubles. I think the party should look for a candidate with success in the real world, an individual who may or may not be involved in politics but not with a long career as an elected official, a person with a story of getting things done and with the mindset to work across the aisle. The individual would not see this as the Republican Senate seat for Maryland, but the Senate seat for all Marylanders. A Republican can win statewide with a message that appeals to moderate Democrats and unaffiliated voters. In 2002 Bob Ehrlich was successful at this and last year Larry Hogan’s message was just as appealing to these key voter groups. The Republican candidate cannot be viewed by Marylanders, particularly Democrats who don’t vote in primaries and unaffiliated voters, as the “regular” Republican candidate. Nationally voters are not enthusiastic about electing career politicians. Yes it happens at the federal level, but mostly because there are so many seats in the House that are either Democratic districts or Republican districts. The Republican candidate must be willing to travel to areas of the state where Republicans often do not visit and voters must believe in the candidate and their message. Statewide in Maryland, the political environment is always difficult for a Republican, but more so next year. The state will have had two years of observing how the legislature is working or not working with the Hogan Administration. President Obama may be able to put himself in better standing nationally as he blames the failure of his programs on the Republican majority. The Republican Party will let this playout over the next couple of weeks and primary voters will decide the party nominees next year. However it is my opinion the Republican candidate who is identified as a successful business person or has had a successful career outside of politics, and someone with a vision for making government work by working together across the aisle will go a long way to helping the party field a strong candidate for the election in November of 2016. Jim Burton is a pollster and consultant who was worked in public affairs and politics across the country. In Maryland last year he worked with winning candidates for the state legislature and at the local level in Anne Arundel County, the Eastern Shore, and Howard County. He can be reached at jimfburton@gmail.com or Twitter @jamescu1992.